Leave it to a San Francisco restaurant to serve up egg dishes with eggs that aren't, well, eggs. Hampton Creek tries to recover from a spate of bad news with its new artificial egg product. At the cozy Flore cafe in the Castro district, the thick, yellow liquid chef Ben Roche pours into a sizzling pan looks just like eggs. But nope -- it’s actually a mixture of mung beans, canola oil and salt. 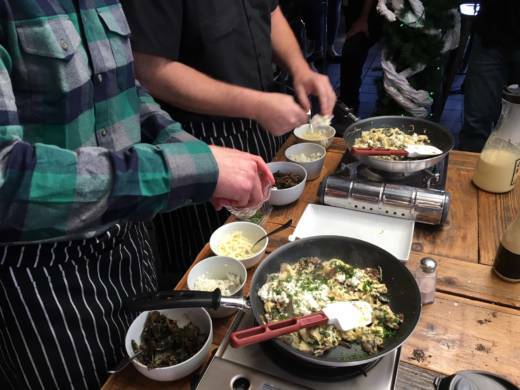 “We have a little bit of spinach, some mushrooms, and we are going to finish it with some goat cheese," Roche says, divulging his not-so-secret recipe. Flore's $14 concoction makes the eatery the first in the Bay Area to put the imitation eggs, which are called Just Scramble, on the menu. The egg substitute is made by San Francisco food company Hampton Creek, which has been itself scrambling, trying to recover from a series of missteps and adverse events. In September the company replenished its board of directors, several months after a mass exodus. The company’s CEO, Josh Tetrick, says it tried a multitude of plants before getting Just Scramble right. “Kidney beans, black beans, and navy beans, sorghum and yellow peas," he said. Hampton Creek's mission statement says the company is trying to change a "mindset" that "does not believe it’s possible to have healthier, sustainable food that is also affordable and delicious." To that end, the company also offers Just Mayo, Just Cookies and Just Dressing. Hampton Creek says making mung beans into artificial eggs requires a lot less water and has a lighter carbon footprint than producing the real thing. To make an omelette, you have to break a few eggs, and the company has certainly done that in recent years. In 2016, Bloomberg reported that Hampton Creek bought back hundreds of jars of Just Mayo from supermarkets across the U.S. The purpose of the program was to "make sales look better to potential investors," according to former employees who spoke with Bloomberg. In addition, "contractors were told to call store managers pretending they were customers and ask about Just Mayo," Bloomberg said. The company claimed this was a quality control effort, though e-mails, receipts and expense reports reviewed by the news organization seemed to suggest otherwise. Hampton Creek spokesperson Andrew Noyes says federal inquiries and an audit by a "Big Four accounting firm" found no evidence of wrongdoing. But in June this year, four of the company's board members topped off a year of infighting by quitting, leaving co-founder Tetrick as the sole survivor. Also that month, Target removed Hampton Creek products from its shelves after receiving unconfirmed allegations they were unsafe. The FDA cleared the company of any concerns, but Target stuck with its decision nonetheless. The company, however, is forging ahead, with plant-based meat, butter and ice cream all in the works. This post has been updated with Hampton Creek's response to Bloomberg's reporting.